454. Sunday 23rd August 2015. Visiting family, friends and pain… | Frank & Donnis Travel Blog "the more we see the more there is to see"
Photographic credit this week goes to Donnis. Not much happened today. Just a lot of moping around the house fighting pain. A visit to the GP brought a fresh supply of pain tablets. Only time will tell if they work. The bandages came off today. The scar is 40mm in length and the sutures were all sub cutaneous. The scar is neat and clean. In the afternoon I visited Dynamic Hand Therapy to commence physiotherapy. Heat pad, vitamin E cream and finger exercise five times a day. Visited Errol Nicole and Amelia and Hannah. Physiotherapy and pain relief are not a match made in heaven. At least the new 12 hour Targin pain relief tablets do give some windows of comfort. At these times I feel incredibly sleepy and fall asleep for an hour or so. Luckily Errol has a comfortable lounge in his office. We visited Joan G who lives in the far western suburbs of Sydney. Her husband Mel and I were good friends. He was a regular team member of my squash team many years ago. We also teamed up to paddle the rapids in my Canadian Canoe on the Shoalhaven River. Mel passed away in May this year while Donnis and I were in Canada. We paid our respects and had lunch with Joan. She also has a comfortable lounge which I used for a much needed snooze. Mel, Rest in Peace my friend. Today we visited my 90 year old Aunt Gwen who lives in Redfern. She has lived in the same street although in several different flats for more than 50 years. After our visit we went to Centennial Park which at 189 hectares is less than half the size of Stanley Park in Vancouver Canada. http://www.centennialparklands.com.au/places_to_visit/centennial_park Stanley Park also has a wonderful location on Vancouver Harbour. Centennial Park, unlike Stanley Park has free parking. We did not take the time for a stroll around some of the many ponds. We did stop for a fish n chips lunch. No Basa. Real local fish. We then drove to Maroubra Beach particularly the high sandstone cliff headlands to the north of the beach. Can you imagine standing on this ledge and casting your line into the raging see thirty metres below? We stopped to look over Mahon Pool to the beach and the southern headlands. 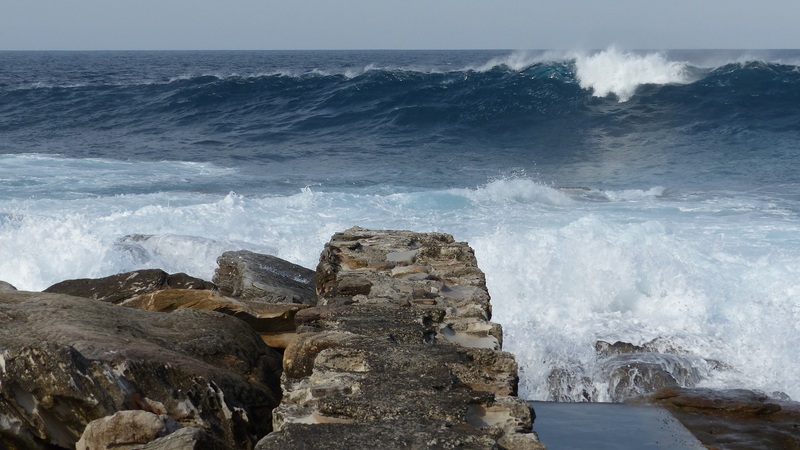 Waves rolling onto rocks at Maroubra. Mahon Pool and on this day was more like a washing machine. 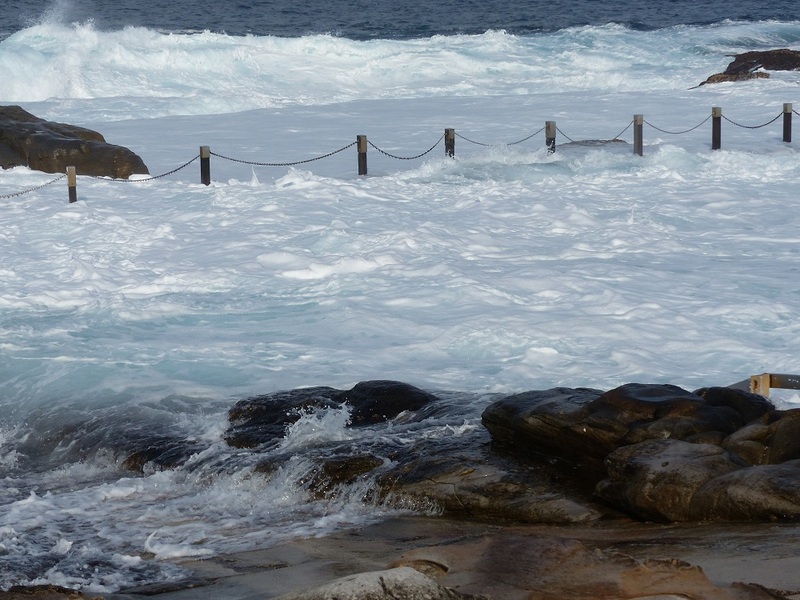 We saw one brave (foolish) man enter the pool but after getting swirled around by a wave quickly left. I wrote about this almost identical visit at post 251 in May 2012. https://frankeeg.wordpress.com/2012/05/06/251-sunday-6th-may-2012-sydney-wollongong-sydney-wollongong-sydney-wollongong/ Today was also a fine sunny day but with the added bonus of large waves crashing over the rocks and through Mahon Pool. Visual clarity was better today and the gun emplacement on the southern cliffs near the rifle range we much clearer. 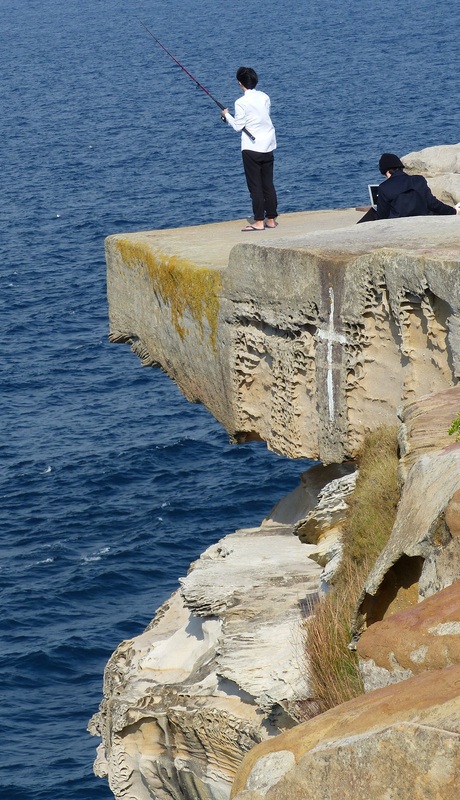 A pill box on the southern cliffs of Maroubra Beach. http://www.whalewatchingsydney.net/ Different tours cater to different needs and wallets. On one tour you are sure to see whales and have air conditioned comfort, toilets and food. The other is sure to see whales, is crowded and cramped and you are guaranteed to get wet and cold. In the afternoon I had hand therapy. Pain relief is not working the way it should. The therapist believes I am in a nerve pain cycle and need a different medication. I have been trying to conserve my Panadene Forte for night time use but am almost out of tablets. It would be so nice to have a pain relief injection to put me to sleep for 6 weeks and when I wake my hand is pain free and back to normal. Apart from the pain, the therapist tells me I am doing great and the swelling has reduced and finger movement has increased. I am sure she is measuring in micro millimetres and is just telling me I am doing well to keep me focused. Saw the doctor who agreed to issue nerve pain relief starting with one tablet per day. It will also make me drowsy and sleep at night. Donnis drove to Wollongong to baby sit. Good for her. I am not a happy camper when in pain. Not a good night. The nerve pain relief, Lyrica, certainly made me drowsy but did nothing to diminish the pain. I slept for an hour at a time. I apologise to readers that we have not visited interesting sights this week and the posts have mainly been about pain. Pain is my biggest reality at present. In the afternoon Donnis returned and we drove to La Perouse to visit Geoff and Margaret for dinner. Also present were caravanners Ron & Eilene whom we met at Dalmeny in March 2013. Looking forward to a new week. This entry was posted on 26/08/2015 at 7:05 am and is filed under Uncategorized. You can follow any responses to this entry through the RSS 2.0 feed. You can leave a response, or trackback from your own site. St. John’s Wort Oil for nerve pain.